This recipe for Whiskey Fudge Brownies is a twist on an old Julia Child brownie creation, and I like to think she would approve. The bourbon flavor in this batch was rather subtle, but it may be due to the fact I used Jefferson’s Reserve which is an excellent drinking bourbon, but might be more subtle in baked goods. For brownies you can use whatever bourbon or whiskey you have in the house. If you use a stronger spirit (something like Wild Turkey) you may want to skip the last step of brushing the tops with straight bourbon — or maybe not! Preheat oven to 350 degrees F. Line an 8 inch metal baking pan with foil and spray foil with cooking spray. Alternatively, you may use parchment paper. Beat eggs with an electric mixer for 3 minutes or until very light. Add brown sugar to eggs and continue beating for another two minutes. With mixer going, add melted chocolate mixture to egg mixture. Scrape sides of bowl and beat in vanilla, 2 tablespoons bourbon and salt. Add the flour and stir just until mixed. Pour into pan the pan and bake for 28 minutes or set. Let cool for about 20 minutes on a wire rack, then brush tops with remaining 2-3 tablespoons bourbon. Let the brownies cool too room temperature, then transfer to the refrigerator to chill for a few hours or overnight.. Lift from pan and cut into 12 squares. The chilling/sitting time is important. The texture changes as the brownies chill. This also gives the bourbon flavor some time to develop, though it is quite mild. Thanks for the review. I wonder if the whiskey acts as some kind of preservative because mine (the portion I did not give away) stayed fresh for a week. And yes, they are pretty fudgy. I made these brownies over the weekend and found them to be simply divine!! The whiskey flavor is just enough and the fudgey factor is off the charts!! Great recipe!! They are very dense and fudgy, and they are thicker than I thought they would be. I cut them straight out of the fridge and packaged them, and it was almost like cutting straight fudge. They did set up well though. As for the bourbon aspect, I notice it more as an aroma (probably from what I brushed on top) than as a actual flavor, but it’s definitely there. Thanks for trying to recipe so quickly. I’m looking forward to hear how they are after they’ve been chilled for a bit. Mine turned out very dense and fudgy. I just found this blog, and it is wonderful. I made these brownies today. My only change was that I used an additional 1/2 oz of the unsweetened chocolate (4 oz bar). I used Southern Comfort. They turned out fabulously (and that was just a taste before I put them in the fridge), and I am sure they’ll be a huge hit at the office tomorrow! These look soooo good! Your recipes are the best! I am looking forward to your blondie recipes next. Been searching for the best blondie recipe…had a couple good hits but bet there are better ones out there. Thanks for another good recipe! I LOVE brownies and these are certainly the kind I can sink my teeth into. I’m not much of a baker, but for brownies, I’ll do anything! Will definitely gives these a look see. They are too tempting to resist! Thanks for noticing the work I’m doing on the categories :). I was going to make a “pardon my dust” type of announcement, as the categories are still being organzied, but I decided to just do it stealthily ;). Right now, the best way to find things is to use the search box. I love the new organization of your Categories. Also, I followed your directions for the King Arthur brownies and they were amazing. Thanks. blondies definitely sound like a good idea to me!! i’m doing an experiment for school on different blondie recipes, so this would help! Joanna, I think blondies are next on the list. There aren’t many blondie recipes on Cookie Madness. I need to populate certain categories ;). Rita, chocolate and whisky are a natural combo. Definitely try it. I’m surprised you haven’t! 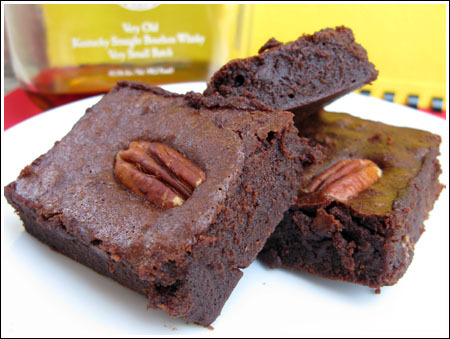 Dawn, believe it or not, another good bourbon brownie recipe is from Cooking Light. It’s not nearly as rich, but it’s very good. It was the first bourbon brownie recipe I tried. Ellen, I am happy to hear of your success with the Levain clones. If you liked the chocolate chip clones, you should try the double chocolate peanut butter chip clones. As for the weight issue, I bake so often that the temptation of eating too many sweets just isn’t that strong. Maybe I’ve had too many stomachaches? Not sure. I sample everything and if I love a cookie I will eat a whole one, but my portion sizes are pretty small. I try not to bake when I’m really hungry because my main weakness is eating the ingredients as I go along. H, if you want to see the original Julia Child recipe, do a search for Julia Child’s “Best Ever” brownies. It’s a great recipe. I agree with you about her collection being meat heavy….or at least that’s how I perceive it. I don’t think I own one JC book, though I have checked out Baking With Julia multiple times at the the library. For a second, when you wrote “if you use Wild Turkey” I thought you were going to say that “if you use Wild Turkey you might forget you were making brownies altogether”! I love Julia Child, and this looks like a perfect non-intimidating version of one of her recipes. Most of her stuff is very meat-heavy but her baking stuff always looked awesome, even in the old black-and-white French chefs. Anna, these look good. Have never had bourbon in brownies, but they look really moist. I am impressed w/your daily bakings, I have to say. If I can crank out one batch of cookies in a week it’s a good week. In fact yesterday my 4-yr old and I made the Levain copycats. Woah. So good. I’ve had the real thing and these are excellent imitations. One thing I want to know is…do you just sample or do you eat much of what you bake every day? I would be 934 lbs. Literally. Wow those look so moist and thick. I’ve never had whiskey in my brownies, but chocolate and whisky do go together in pies and cake, so why not brownies. Look forward to trying this. I don’t remember ever having brownies with whisky! I’m not crazy about whisky but I guess it’s such a small amount that flavour won’t really be overpowering. They look very moist!